For many of us it seems that we’ve lost this race before we even start. But this is not so. Very simple indeed and yet so very, very hard in this day and age of fear mongering media. We worry all the time about life. What about our bills? What about our children’s health? What about that promotion I want? What about that shooting 4 states over or in that other country? Well I’m here to tell you that it’s not your job to “worry” about those things. Worrying about something and having concern for something are two different things. If there are terrorists on the other side of the world it doesn’t help you in your life one bit to worry about the problem. Let the people who can do something about it handle that problem. If you are concerned enough about a problem, then see how you can become part of the group which deals with that problem. As an example, Pat Tillman was concerned enough that he joined the military. So what about those dishes? Are you going to worry about them all day and night or are you going to consider them a matter of importance and then wash them or get someone else to wash them? As you can see, Zen can be applied to all facets of life. But is this true Zen? 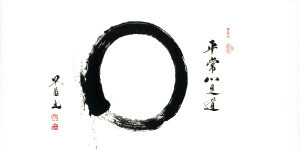 According to many Zen practitioners it is merely the surface of Zen and living a Zen life. A great look into what Zen really is can be found here. In short, it’s simply being yourself, your true self. It’s an awareness and an insight into yourself which brings calm and focus. It’s also being a bumbling, clumsy goof if that’s who you really are. Own it. So Zen is being who you truly are and not worrying about the small stuff you cannot change. Sounds easy! There’s one other main focus of Zen though – meditation. Well, besides the many benefits of meditation (and there are TONS! ), you don’t have to do any specific type of meditation. Meditation has as many varieties of form as there are religions in the world – and then some! Meditation is simply quiet, mindful reflection about yourself and your life. It can be 5 minutes of quiet thought, 5 minutes of religious prayer, or doing some slow movement yoga. Or you can even do the traditional Zanzen (sitting meditation) that so many of us think about when we think of meditation. Whichever form you choose make it something you enjoy and are comfortable with. How much of a Zen life are you living?